Fire crews responded to a brush fire Sunday in the East San Jose foothills that quickly spread to two homes. The one-alarm fire near Mt. Hamilton Road and Garcal Drive was reported about 1:30 p.m., and was believed to have been caused by downed power lines. 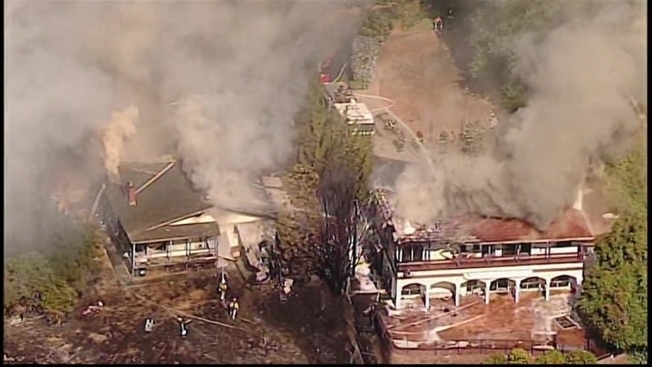 Aerial views of the fire showed smoke and flames coming from two homes. More than a dozen fire trucks from a few different departments were at the scene to make sure the fire didn’t spread even more. Neighbors said the fire started with a bang. "I heard an explosion, some sort of explosion, so I came out, looked around, saw the house was on fire," said Brett Bell. Neighbor Skip Anderson said they had a power outage, and he went outside to investigate. "And then I heard a big boom and then came out and saw a large column of smoke from the building," he said. Fire investigators said it’s not yet clear if a power line snapped and sparked the fire. But firefighters arrived to find flames that swept through the dry grass and reached one of the two homes quickly. The resident of the house managed to get out safely, but some of her pets didn’t. "A lot of birds, a lot of dogs," San Jose fire Capt. Brad Cloutier. "We were able to get most of them out of the structure; a few right now are still unaccounted for."